Going on a trip is meant to bring relaxation and happiness into one’s life, however many can admit packing gives comes with anxiety. What am I going to forget? Did I pack too much? Will I have enough room to bring back a few things? To eliminate these packing anxieties here are a couple strategies I use myself when packing. 1) Head-to-Toe. Begin at your head and move down your body thinking of everything you need as you go. For example; hat, sunglasses, shirts, shorts, pants, shoes. Obviously this would be done in further detail, but you get the jist! 2) Inside out. Another approach is starting with your under garments and then moving outwards. This strategy works well for clothing items but do not forget to make a mental note to include electronics, toiletries and for the girls make up and jewelry. 3) Activity list. Thinking about what you do in a day from when you wake up until you go to bed can really speed up the packing process. As you do so think about everything you need and use while doing these activities. -Sunscreen: the sun is a lot hotter then you can imagine, protect your skin! -Long skirts: not only are these comfortable and in style, you will fit in perfectly. -Strappy sandals: don’t bother bringing flip flops, Italians always walk in style! -One pair of walking shoes: all you do in Florence is walk, walk, and walk. -Mosquito repellant: It’s do or die over here, a constant war humans vs. mosquito’s! -Only ONE pair of heels (preferably wedges): the cobble stone streets are hard to walk on and most people go out in dressy sandals or flats. -Small side purse with good zipper: avoid those pick pocketer’s as much as you can. In general, bring light clothing and in a diversity of options (shorts, pants and skirts). Florence is known to experience all seasons in one day. In the summer months you may experience a few storms, which I personally find quite amazing. Sitting back and watching the thunder and lightening can sometimes be relaxing if you are in the right place at the right time. What you need to know is that in Florence it will down pour very quickly and suddenly then usually it will pass. Bringing an umbrella would be a good idea! 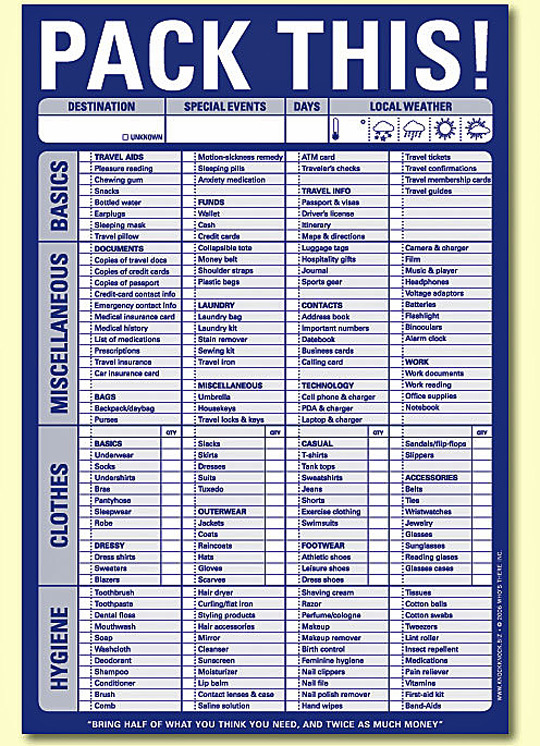 Hope this helps and takes some time off your packing. Happy Travels! As many of you know, Italians live and breathe soccer. 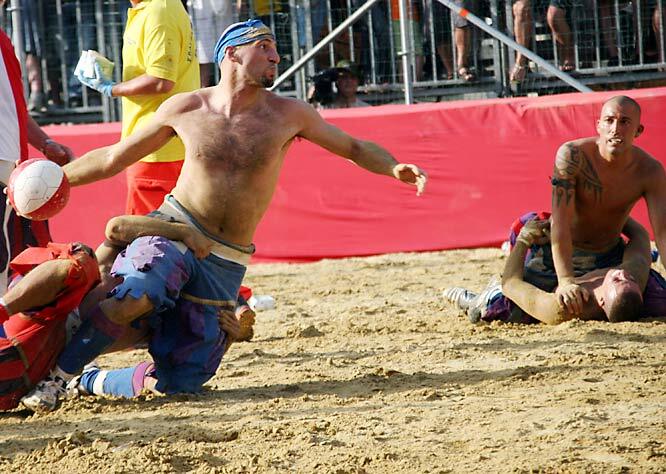 This sport keeps all Europeans on their toes, especially during the world cup. The competition between each country is quite outstanding. Restaurants and bars play games on their big screen TV’s to attract a large crowd of viewers! 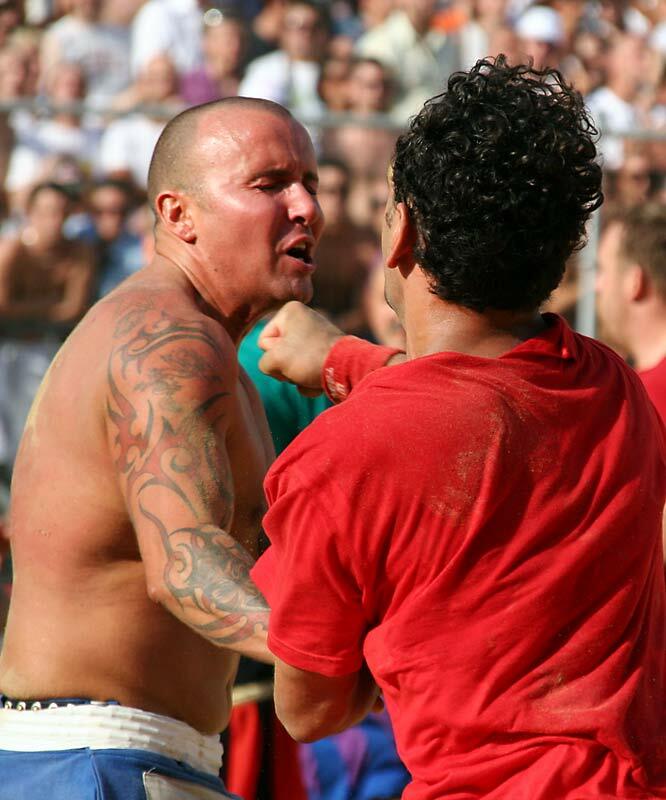 In the month of June the Calcio Fiorentino games take place in the Santa Croce Square. Calcio simply means to kick thus, after translation it would the “Florentine kick game”. The history and extraordinary rules of calico fascinates many people, drawing them in to watch the games. Here are a few points to fill you in on the sport. 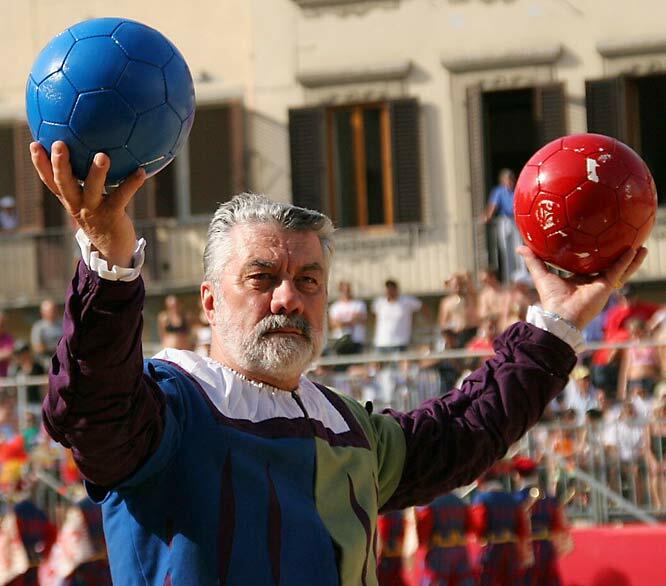 History- Calcio is an early form of soccer that originated in the 16th Century. It is said to be the game that started out all rugby and football events! Initially, the games were reserved for the wealthy citizens and it was said that even high public figures (such as the popes and royalty) were known to play. In 1930 the games were back in action after being dormant for two hundred years! I would not be surprised if these games continue for many more centuries- I mean who doesn’t like to watch something historical and full of violence (this is a must see for all men!). To this day men take the game very seriously, dedicating their life once in the timeless arena. Rules- Here I will discuss the rules or better yet, lack of rules in Calcio. The official rules were first published in 1580. There are three games, each a duration of 50 minutes. The idea is for players to use both their hands and feet to move the ball up and down the field. Each team must take the ball beyond their opponent’s defense line. One of the only few rules that apply are no sucker-punching and kicks to the head. Head-butting, punching, elbowing and choking are all fair game! Since no substitutions are allowed, this game can get quite bloody. As you can imagine, this is very VERY entertaining. Teams- There are four teams with 27 players on each. A team that once belonged to the roman gladiators represents each district in Florence. The teams are as follows; Santa Croce (blue team), Santa Maria Novella (red team), Santo Spirito (white team), and San Giovanni (green team). Each team dresses up in some sort of costume to display their pride; of course all in matching team colors. 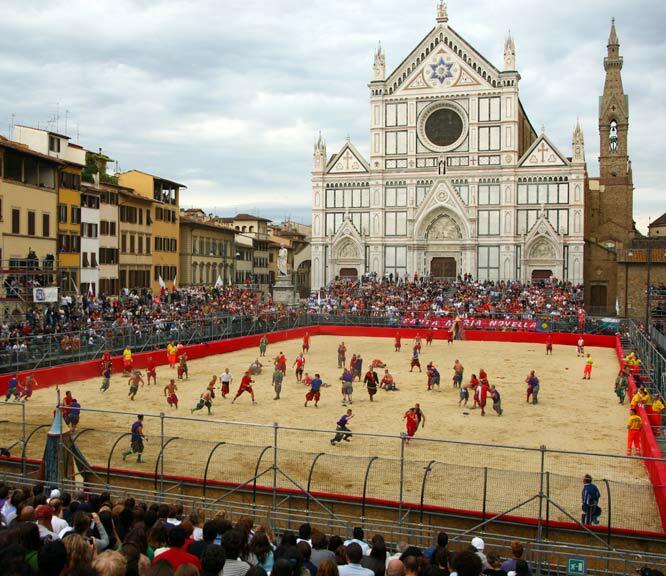 The soccer tournament is said to be an honor of San Giovanni, thus the final Calcio game on is June 24th (Florentine holiday for Giovanni). The finals are played during the evening, which is followed by an amazing display of fireworks on the Arno River. Cherishing the ongoing tradition of Calcio Fiorentino, Florence has kept the medieval spirit alive by reliving an event so ancient. To check out the Official Facebook page click here. I will also provide you with a well-filmed video to summarize the games, enjoy! North American culture is quite different to the European culture in many ways. Although everyone is aware that culture varies depending on where you are in the world, travellers still seem to be shocked at the major differences between Florence and the United States. While I do believe spontaneity is key in Europe, you can never do too much research on the place awaiting your arrival. I am here to help you adjust to the everyday life in Florence by giving you a couple friendly warnings on obstacles you may encounter. The following is a list of a few things to be aware of before coming to Florence; this will save you time, money and a whole lot of stress! 1) Breakfast Food. It is this simple- Italians want to fatten us up! Isn’t breakfast supposed to be an important, substantial and healthy meal of the day? In Florence it is next to impossible to find a café that serves eggs, fruit, toast, and/or bacon. Desert for breakfast anyone? There is a large array of fresh pastries lined up along shop windows each morning waiting to the devoured. Here’s my solution- get ahold of any fresh juice shops you can find to get your nutrients; there are a few around the city! 2) Crazy Traffic. Once you arrive in Florence your personal space does not exist. You must be careful in the crowded streets as people will walk in any and all directions, surely cutting you off. You must be extra cautious for the bikes, cars and buses motoring around the city. I often feel drivers are playing the mind game, “how many pedestrians can we scare today”. All in all, my story in Florence goes like this, Bus-1 Me-0. Don’t walk to close to the edge of the sidewalks or the side mirror will clip you! 3) A Late Start. This applies for many things such as store opening hours, dining hours and bar hours. If you arrive at a restaurant around 6 o’clock be prepared to be eating with the company of the people you are with and the staff. In Italy people are arriving for dinner at 9:30 to 10 o’clock. Do not make the mistake of going to a bar/club too early. You will most likely get there and leave before any Italians have even arrived! Between 1 and 2 is when bars begin to pick up. 4) No One-Stop-Shops. One girl came into the office looking for a Walmart. Although it is a funny question to ask in Europe, there is actually nothing similar to it! If you need to run errands allow yourself double the time you would in America. You will likely need to walk all around town and hit at least 3 to 4 shops. 5) Waving down the Bus. Who knew there was a specific way to hail a bus, isn’t standing by the bus stop sign enough! Here is the trick- you must hold you hand down low and wave. If you hold your hand up high, there is a good chance the bus will pass you. I know this is very technical, but it is something one must be aware of! 6) Coffee. Italians drink their coffees very differently. First of all, the coffee is never scorching hot. With the very hot weather you would think that they would serve iced coffee but Italians have something against cold milk. You will also not find any flavored syrups to add to your coffee’s- that’s right no caramel or vanilla lattes! A final tip, if you order a large coffee you will get one espresso shot and a lot of milk. You must clarify you would like two espresso shots. 7) Expression and Hand Gestures. If you are travelling to Italy for only a short period of time you may not have the desire to learn the language. Thus you may try to survive off hand gestures and tone of voice to understand the direction of the conversation. This in fact will only confuse you more! Italians may seem angry with their arms flailing in the air, yet they are simply debating on a very insignificant point. 8) Hours of Operation. If you are anything like me and have a very irregular eating cycle you should keep in mind the hours of operation of all cafes and restaurants in Florence. For example, the well-known Gusta Pizza is closed from 3 to 7pm each day! To avoid being a disappointed and hungry traveller, use the Internet to research the restaurant before you go. 9) Water. This will seem insane to most Americans and Canadians but yes, it is true, you have to pay for water everywhere you go. In a restaurant they will serve you large glass bottles that you can self- serve from at a cost of around 2 to 3 euros each. Wine is almost cheaper then water, but don’t let yourself get dehydrated! 10) Tipping. At restaurants here there is a cover charge of about 2 euros and up. This serves as the tip for your bill so you do not need to leave any extra money. Some people actually find it offending if you tip more, and this I do not know the reason for. Finally, if you are travelling as a group of students be aware that you cannot split bills. I suggest to always have cash on you in case you are going with a large group of people. Pros: About an hour of silence before they fix them all again. Cons: Very time consuming. Technical expertise required, unless a simple clogging method is used. Would most likely lead to at least one manslaughter charge. Pros: Erm, none spring to mind. Chance to get outside for a little while? Cons: Probably very difficult to garner enough support for it considering what we’re talking about is a minor annoyance rather than a genuine problem. Again, would probably lead to some kind of arrest. 3. Sternly worded letters to the Mayor, Prime Minister, President, President of the European Commission and Secretary General of the U.N.
Cons: Waste of paper. They definitely wouldn’t give a toss. 4. Just putting up with it (I seemingly have contradicted myself now. This is a perfectly reasonable solution). Pros: Really, really easy. Everybody is already well practiced in doing so, meaning no special training is required. The only option. Cons: No change in situation. Increased hearing damage for all. If fashion is something that sparks your curiosity, you may wish to experience Florence, Italy from June 18th to June 21st. Between these hot summer days, the Pitti Uomo is in full swing. One could also call this ‘The Beautiful People’s Club’. This renowned fashion week attracts models, designs, bloggers and photographers from all over the world. You know what this means- great people watching! As high fashion men and women stroll the streets bystanders are able to admire their impeccable, well-put together outfits. As the busy city gets exponentially busier, events get set up on the streets. An even bigger bonus- several events include free alcohol and are open to the public! This will be one of the only nights you will want to be wearing your high heels ladies (other than that the uneven cobblestone streets will guarantee you an ungraceful face plant). This is the best place to meet future contacts, especially if you are interested in the fashion industry. Shops are open after hours and DJ’s are brought in playing euro-trance tunes to keep shoppers happy. If you are planning a trip to Florence, this could be the right time for you to come. If you are already in Florence, enjoy every minute and absorb all the new fashion trends Europe has to offer! 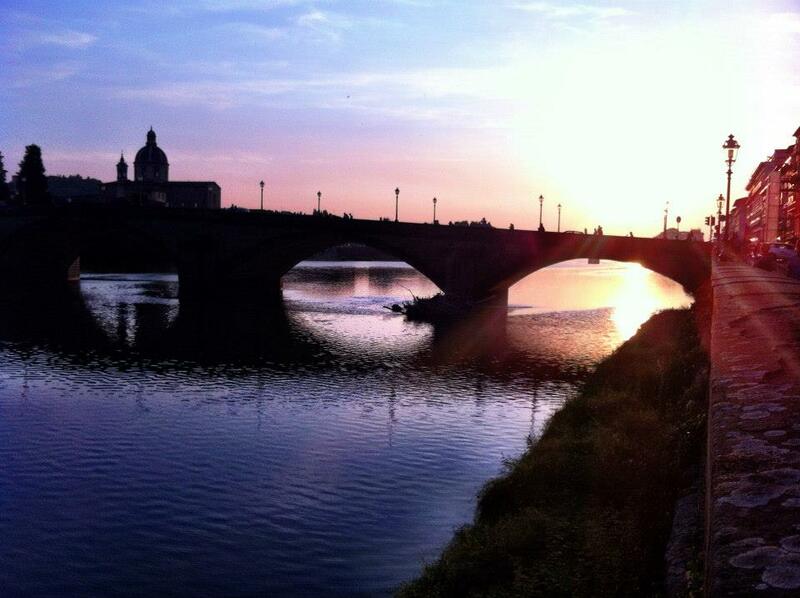 Firenze, Firenze, Firenze! This beautiful, romantic city is the only place I wanted to be this summer. A spontaneous trip from Canada to Italy has begun my summer with great people and great food (to say the least!). I am a student traveling with Global Experiences, a program that organizes Italian classes as well as internships. The Italian classes were challenging but rewarding once I was able to converse with others in the bar and shoo away unwanted strangers (girls, be cautious as men don’t know the meaning of no). After three weeks of classes I feel fortunate to be an intern at When In Florence, an advanced student services company. The friendly staff is able to help all tourists with almost anything that is needed during their stay. 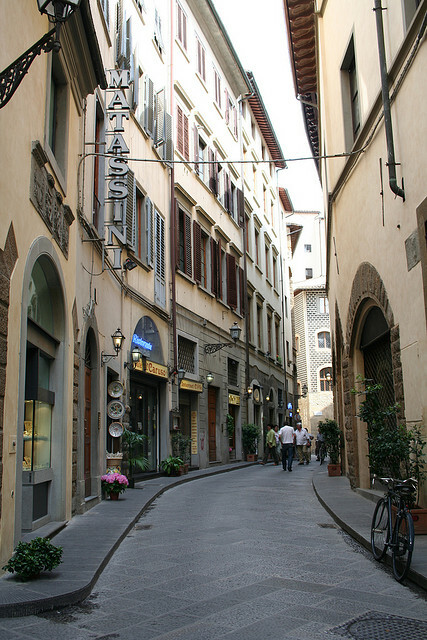 Since being in Florence I have explored almost all routes and side streets that are lined with restaurants and shops. A piece of advice for all travellers- don’t stick to the main roads, the most unique places are hidden! For all the girls out there, if we share a common interest in shopping the San Lorenzo Markets is where you should get your new handbag, wallet, coin purse and other leather goods. Since there are hundreds of stands around the city, there are a few things you must look out for, the Firenze sign engraving and the delicious smell of fresh leather. Additionally, the Santa Croce area and side street around the Duomo have affordable shops for students. If you are looking for something a little more pricey shopping near Piazza Della Republica is your best bet. Happy shopping travellers! On another note, there is never a dull moment in Florence. 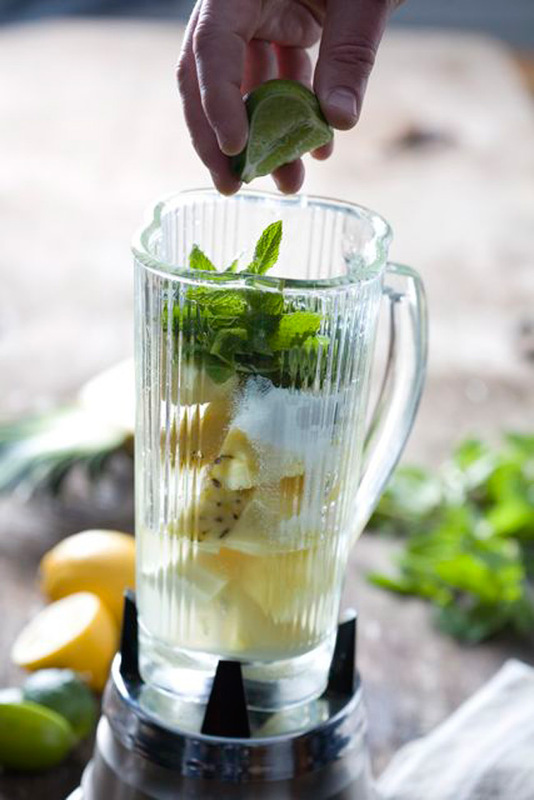 Not feeling a club or bar? Don’t feel like staying in? As I am one of the most indecisive girls on the planet I always face the problem of what I should do. When in doubt, grab a bottle of wine from any store (or even stands on the road) and head to one of the several bridges crossing the Arno River. I can guarantee you a beautiful sunset, a great crowd and many talented musicians. Last but definitely not least, travellers you must keep traveling! There are several stunning locations around Florence perfect for day trips as well as weekend trips. A few close cities are Lucca, Sienna, Pisa, Cinque Terre, Venice and Rome. Some places worth going for a weekend include: the Amalfi Coast, Croatia, Greece, Naples, and Sicily. There are several companies that will take students on these trips for very affordable prices, including When In Florence. I highly suggest taking some of these trips as you will not waste time getting lost in a foreign city and will be able to see everything you need in a short period of time. While enjoying every minute, take every opportunity that gets thrown your way and be open to the different culture and new people you stumble across. With this in mind we will share a similar experience, simply the best trip of your life! Florence is a city full of character and personality. As you walk down the narrow streets each one is more interesting then the next. This lively city is a great place for students to visit for a weekend or even to study for a long period of time. The following lists the top ten places to go to, ranging from sights to nightlife to restaurants including links to find tickets. These are listed in random order, so if you do not have time for all pick what interests you the most! 1)Piazza Del Duomo- The Duomo is one of the most popular sights to see in Florence, once you see it you will understand why. It’s large, intricate exterior is breath taking and its beauty continues to the interior. If you are up for it hike the Duomo’s 414 steps to the top to see Florence from a different angle- it is truly spectacular! 2) Piazzale Michaelangelo- A small hike to the top of this hill will get you an incomparable view of Florence. It is easy to purchase wine, champagne and beer once you reach the top as a reward. Enjoy a drink while listening to the street performers and watching the sun set over the city of Florence. If you care to go dancing after, Flo, an outdoor seasonal club, is nearby. 3) The Secret Bakeries- Most of these wholesale bakeries are only open for the night owls and partygoers. Some are difficult to find however asking a few locals they should be able to direct you in the right way. One is located on via Canto Rivolto 2, an alleyway behind busy via De’ Benci. The cheap freshly baked goods should satisfy all cravings. 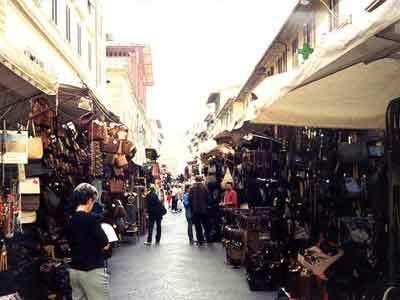 4) San Lorenzo Market- Italy is known for their high quality leather. There are blocks upon blocks of leather goods and jewelry to keep you occupied for hours. Watch out for pick pocketer’s and be sure to bargain! 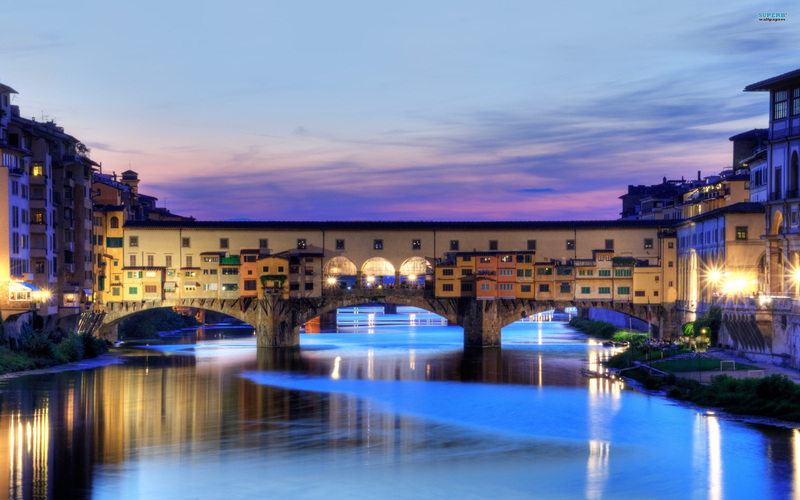 5) Ponte Vecchio- This is the oldest bridge in Florence which usually covers the face of postcards. It is lined with a variety of jewelry shops that have been there for hundreds of years! At sunset, street musicians play on the middle of the bridge while people gather around sipping on pre-bought bottles of wine. Just below the bridge there is a grassy area along the river where you can relax, away from all the traffic. 6) Piazza Santo Spirito- If you want to find a place farther away from tourists and closer to the local life, this is the place to be. This Piazza has several cafes, restaurants and bars to keep you occupied. 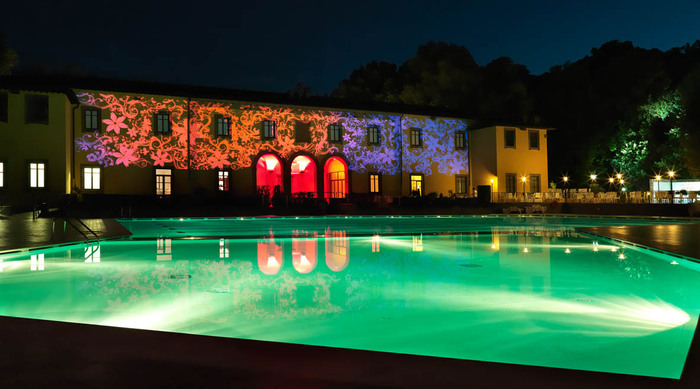 7) Parco Piscine le Pavoniere– In the months of summer Florence can get scorching hot. This is the best place to cool down and relax poolside. It can get very busy as it is the largest pool with a restaurant and café on location. During after hours the pool turns into a bar! 8) Gusta Pizza- For all the pizza- lovers out there, this place is a must! With the best quality and reasonable prices this pizza spot has claimed a title for one of the best pizza places in Florence. If you’re lucky the chef may even make your pizza into a heart for you! 9) Grom Gelato– Italian gelato is something you cannot leave Italy without tasting. This is a competitive industry in Florence and you will have no problem finding a gelato place within a one-block radius. However, if you want the best quality go to Grom. The service is great and there is a very large selection of flavors. 10) Hotel Cavour Rooftop Bar- This roof top bar is the nicest in the city! A great selection of drinks and an even better view! This place is something a bit more laid back then the typical bar or club scene in Florence. If you want to see Florence in a day, this is also possible although be prepared to do a lot of walking! 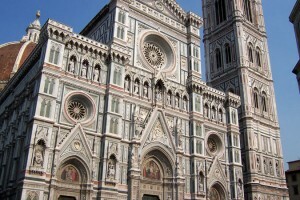 There are several companies that can guide you through the cities main attractions, such as When In Florence. You have several options, you can go by Foot, Bike, Vespa and even by Boat! When In Florence is the one-stop student services company for international students studying in Florence. Our goal is to provide information and services specifically tailored to your needs, which may other wise be difficult to obtain, overly expensive, or otherwise inconvenient. We use our experience and contacts within the city to provide students and other English speaking residents with the best deals on travel, home food delivery, car rental, cell phone rental, home wares and useful items and much, much more. We also offer a personalized events planning service and guided shopping tours around the city. 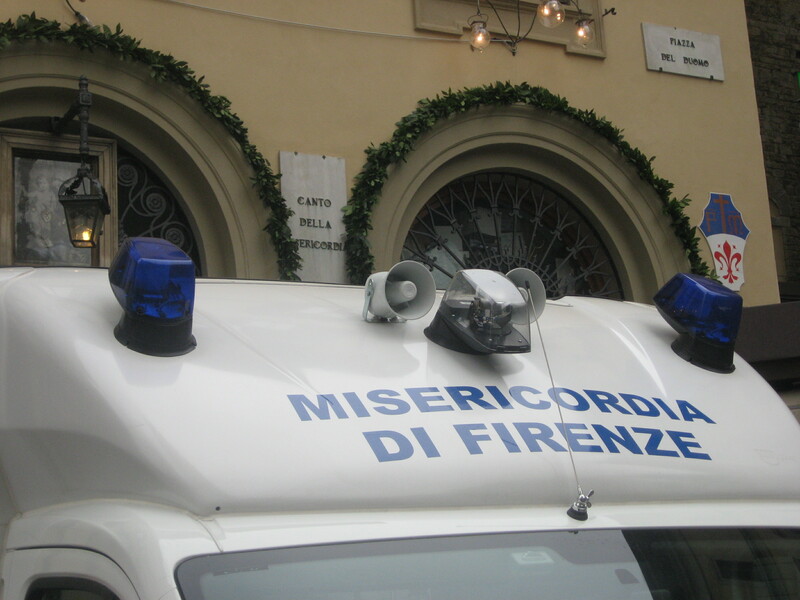 This is our blog where you will find articles and posts about what life in Florence is like.